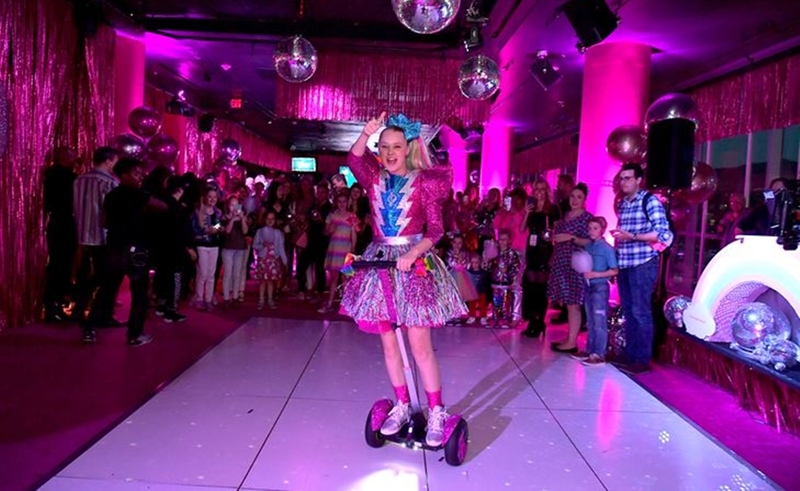 JoJo Siwa doesn’t turn 16 until May 19, but that’s not stopping the gravelly-voiced and incomparably energetic YouTube star from getting a head start on this year’s festivities. Siwa celebrated her birthday earlier this week at the W Hotel in Hollywood, with the event being filmed for a Nickelodeon special dubbed JoJo’s Dream Birthday, premiering on May 18 at 8:00 pm. The word ‘Dream’ is a nod to other projects that Siwa has in the works, including a five-song EP and accompanying tour, during which she will trek across roughly 70 cities on the Party City-sponsored venture — kicking off on May 17 in Arizona and concluding on Sept. 17 in Texas — produced by Nickelodeon and AEG Presents. At her birthday party, Siwa welcomed numerous celebrity friends and fellow YouTube stars, including Manny ‘MUA’ Gutierrez, drag star Alyssa Edwards, Colleen Ballinger, and Joey Graceffa. Also on the guest list was North West — the eldest daughter of power couple Kim Kardashian and Kanye West, who appeared in a headline-grabbing collab video with Siwa earlier this month that has nabbed upwards of 7 million views (below). In addition to her burgeoning music career, Siwa is best known for her blindingly bright get-ups and signature side ponytail, fastened atop her head with bows that she also vends via big-box retailers nationwide. In fact, Siwa is such a proficient merch hawker that her house includes a merch ‘store’ of sorts, where she keeps her vast array of licensed goods to showcase in videos. Siwa rose to fame on the Lifetime reality series Dance Moms, and has since parlayed her popularity into 13 million YouTube subscribers (across two channels) and 8.1 million Instagram followers. Some of her music videos have achieved gob-stobbing viewership on YouTube, including “Boomerang” (685 million views), “Kid In A Candy Store” (161 million views), and “Hold The Drama” (120 million views). Nickelodeon signed Siwa to an overall deal last year.